If you type “social butterfly” into a generic search engine, the result is along these lines: “a slang term for a person who is socially dynamic, networking, charismatic, and personally gregarious”. 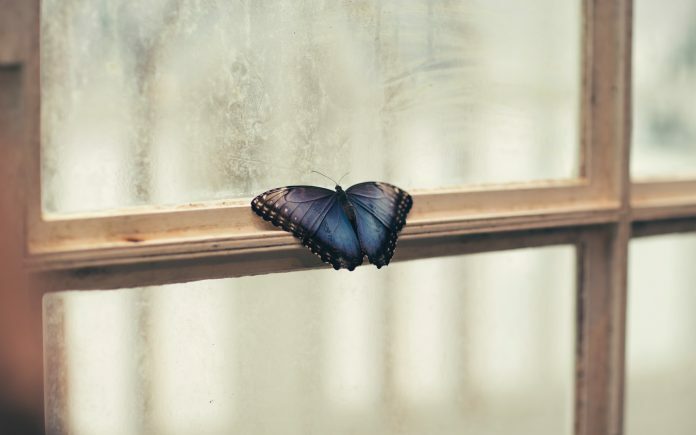 Therefore, throwing in the word “anxious” results in an off-kilter term, although it suggests an image of those pesky butterflies you can get fluttering in your stomach. For someone with anxiety, everyday moments are heightened and simple tasks can seem confusing. While everyone else, it seems, is breezing through the first few weeks of university, those with anxiety either put on a mask that screams they too are absolutely “loving” it, or they hibernate to avoid unbearable moments. I am a funny mix of these two manifestations of anxiety. You see, there’s the me who adores being around other people, learning from others whether academically, socially, or culturally; but then there’s the me who retreats and keeps her bedroom door locked all day, trying not to make a sound, just so she doesn’t have to confront the situation on the other side of the door. I have heard people call anxiety “overthinking”, and I can see where they are coming from. But it is much more like a tornado, sweeping up all that you hold dear, twisting and manipulating and casting off the debris. I recall the doctor’s appointment so clearly: my efforts to explain what it felt like at fifteen to have my heart pounding at the thought of every task I had to do. Despite the lack of sleep, I went into school pretty much every day, and I was blessed to be supported by teachers who tried their best to understand. I wanted to learn; I didn’t want to feel like there was something wrong with me, but I was also terrified of what was going on in my head. When my anxiety started manifesting in social situations, I panicked. I have always envisioned myself as this happy-go-lucky, social butterfly: extroverted and happy to mingle. Yet, when I think back to my childhood, I can clearly see times when I hated being left at social gatherings: even my best friend’s birthday parties. And I remember coming back from the first society meeting I really wanted to join at university, crying my eyes out because everyone else knew at least one person. I don’t like to play the victim, because anxiety is part of my daily routine. I have always been emotionally expressive, and if I am nervous you can see it in my eyes, hear my voice quiver or see my hands shake. But there are days when it is hard. There are days when I have the symptoms of a virus, or a sickness bug, but they are caused by the way my body reacts to anxiety. That is what is hardest to explain to the sceptics who think I am “lazy”. What they don’t tell you about your mental health is that it can cost you friends. Being kind to others is a sure-fire way to build a friendship, as is taking an interest in that person, but mental health “issues” can cause that much paranoia that you become withdrawn. Furthermore, it is difficult to find people who understand when you need, not want, a day to yourself, just to piece yourself back together again. I think it is fair to say that we all get nervous speaking to people for the first time. For many, that is the scariest part of starting university. “Everyone is in the same boat” is the most frustrating sentence for someone with anxiety, because they know it is true, but it does not ease their feelings. Personally, it took me well over a year to ever feel “settled” at university, but once I realised things don’t have to be perfect, a substantial amount of pressure dissipated. It also takes time to develop genuine friendships and work out whether someone wants to be friends with you as much as you want to be friends with them. Regardless of your own wellbeing, it is important to allow yourself to open to people and speak your mind: communication is key to every exchange in the world, no matter who participates. A month into living in France for my Year Abroad, I am not completely settled. But I am learning to be okay with that. While I won’t ever assimilate so well into any country or culture that I lose myself, I like the fact I have my own personality and can at times be rather outspoken and defensive of what I believe to be true: it is a good thing, as it is what helps me overcome the anxious thoughts. It is the small, every day, “normal” tasks that you conquer which put you in the most control, and they allow for times of spontaneity which make me my happiest. Anxiety, for me at least, is both a curse and a wondrous blessing. Among other things, it has taught me that all we need to do is be kind to one another and ourselves.